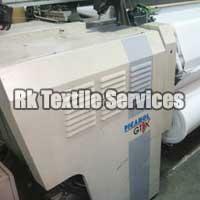 Active since 2004, RKTS has been operating as a single window solution provider for all sorts of used machines. We are licensed to source, supply and export used picanol weaving loom machines across the globe. Our company base is located in Surat (Gujarat, India) and our product range is inclusive of used picanol air jet machines and used picanol rapier machines. With exceptional transportation facilities, our diligent team delivers the product basket in the committed time span. In order to meet ever-evolving requirements of the clients, we have installed a capacious storage facility. This unit helps us in keeping stock of products in different grades and specifications.